If you are one of those people who is drawn to France because of the food and wine, then the week of October 13-19, 2014 is for you. Perhaps you are asking what is the Fête du Goût? The English translation is simply Festival of Taste. Since 1990, on the initiative of the food writer Jean-Luc Petitrenaud, the Ministry of National Education has sponsored a week in October to bring together local, regional and national sources in order to learn more about France’s culinary heritage and the food industry. French students from kindergarten to high school participate in the event. The aim is to educate consumers, including children, about the diversity and the pleasure of tastes and flavors. Of course, this includes encouraging good eating habits as part of a balanced and sustainable way of life. But enough of the dry explanations and on to the fun! 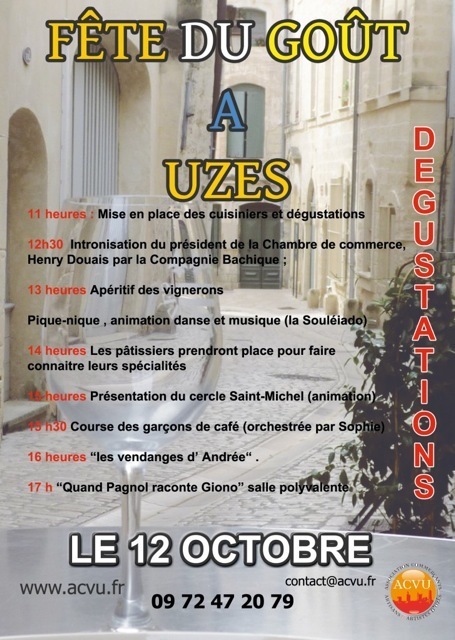 In Uzès on Sunday, October 12, there will be a full day of festivities. There will be foods, wines, music, dance and even a waiter’s race! This will be a great time for the whole family. If you are in the area, don’t miss the fun. Or, make a note on your calendar to come to Uzès next year to attend! !